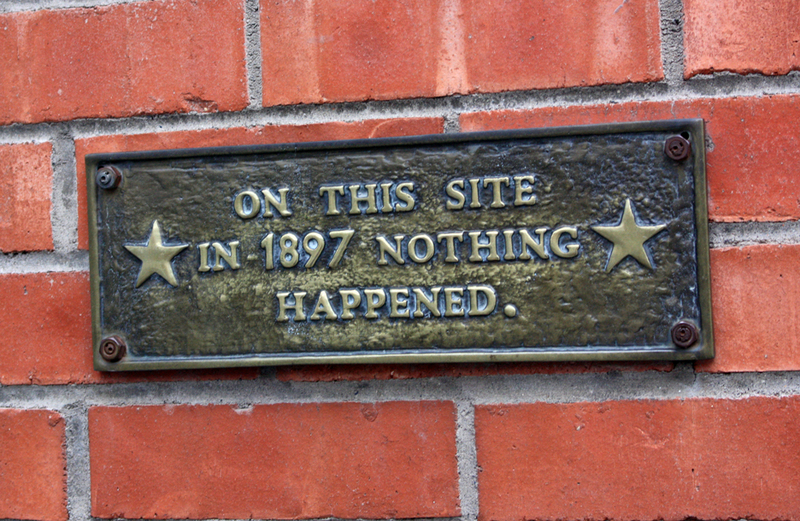 Nothing happened here. Move on. 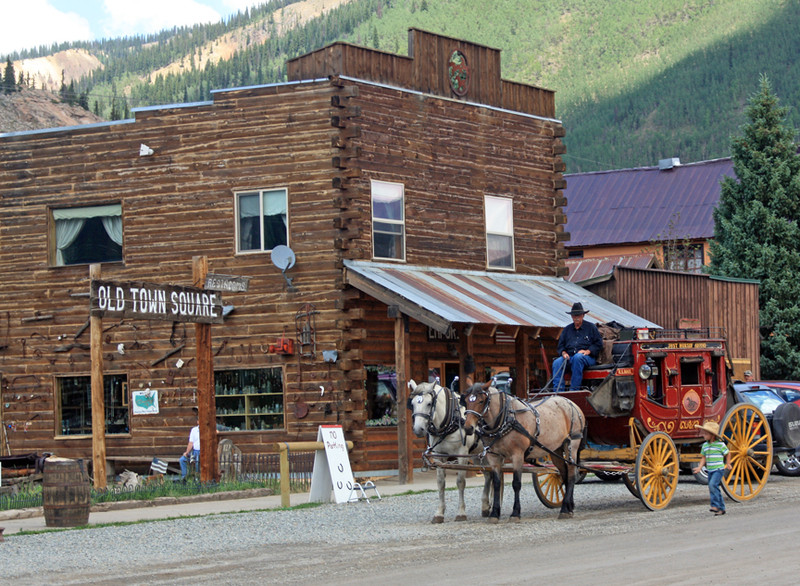 Wednesday, July 11 marked the third day of my journey through Colorado’s mining towns. Because of hitting a rock on my first day, I had to deviate from my carefully planned timeline in order to find a new rim for my minivan, which led to an unexpected detour. 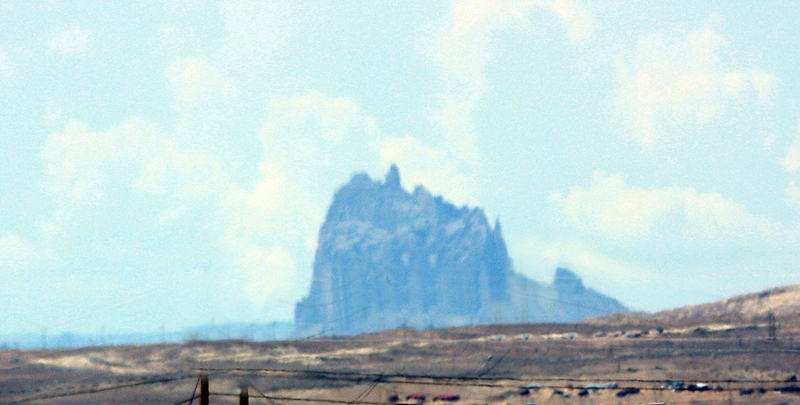 The Shiprock as seen from Farmington, NM. After striking camp, I set to work trying to track down a rim for my car. A shop in Durango didn’t have anything, and said my best shot was to try the wrecking yard south of town on Highway 160. They didn’t have anything like it, and the owner there checked his computer which located several new rims, for over $300: one in Albuquerque, one in Cañon City, and one in Denver, all too far away and too expensive. I called the Dodge dealership in town, and they suggested calling some wrecking yards in Farmington, New Mexico. The second yard I called did have a used rim for a Dodge Grand Caravan. Finally! But it meant a 45-mile detour south. I had never been to New Mexico before, unless you count the time I visited Four Corners years ago, and then I only had part of my body in the state. 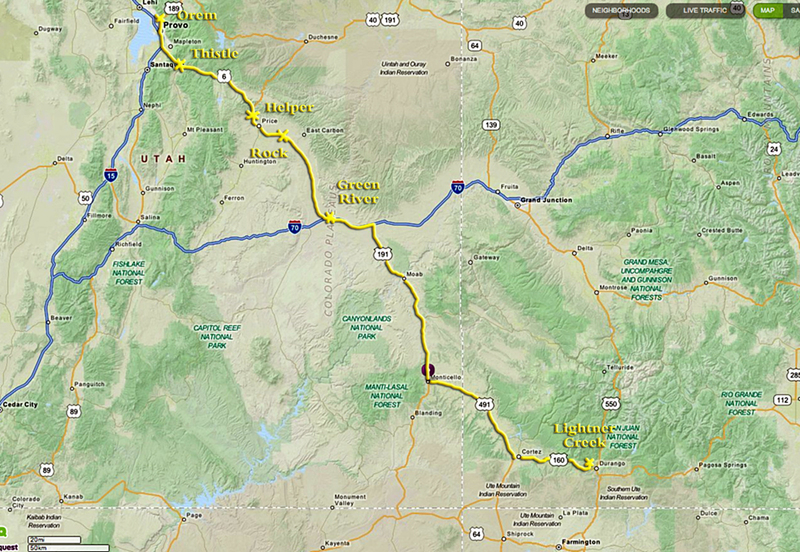 Of all the western states, it is the one I’ve missed visiting. So here was my chance at last! At the suggestion of the lady at the wrecking yard, I took 160 west about 10 miles, then 140 south. I got stuck for half an hour waiting for road resurfacing near Breen, travelled on through Red Mesa and La Plata into New Mexico to Farmington. I missed the turnoff to the wrecking yard, and realized I’d gone to far and pulled over. Up ahead to the west I could see the Shiprock, a famous landmark in these parts. I’ve never seen it before, and snapped a photo even though there were power lines in the way. I knew a Navajo kid in high school named Albert Todacheenie who was from Shiprock and I’ve wondered since whatever happened to him. I got the used rim and found a tire store to mount the rim and tire. They had quite a crowd waiting, but the prices were good. I walked in blazing heat (near 100 ° F) to find someplace to eat, a good Mexican restaurant about a half-mile away. After getting my car back about 3:30, I headed north out of town on Highway 550. 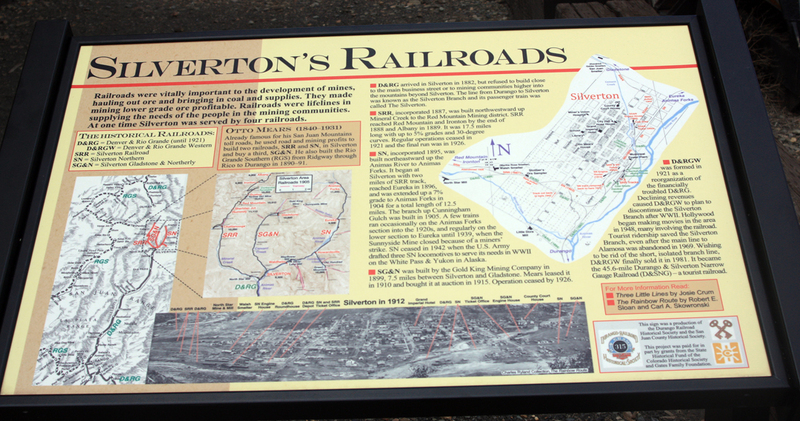 I was over six hours behind schedule and knew I wouldn’t be able to stop in Silverton to take the mine or the mill tour as I had originally planned. 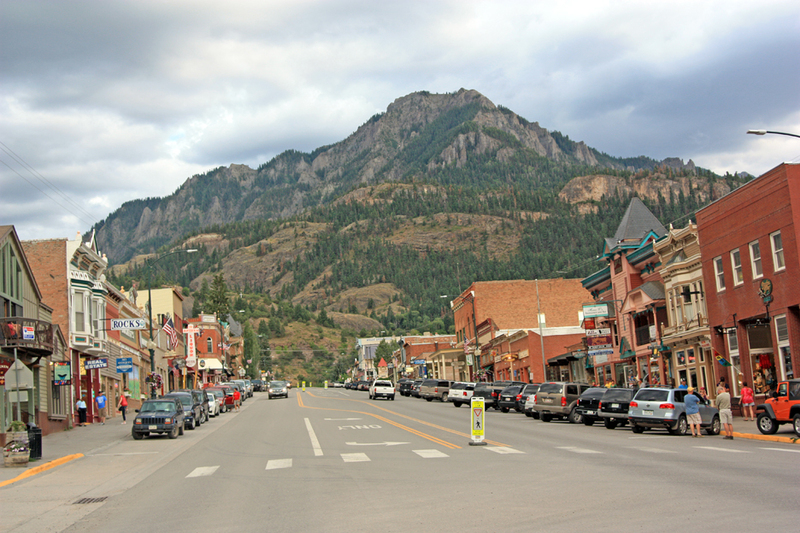 I had to be in Ouray that evening, as I had a reservation at the Western Hotel there. So I had to make some choices. In order to get back to Silverton, I would have to miss going through Alamosa and seeing Great Sand Dunes National Park on Saturday. It was a hard choice, but I was here to see the history of Colorado mining and the sand dunes had always been optional. So I wound up back in Durango. Again. After favoring the spare tire for three days, it was hard to get used to driving at normal speeds. I took 550 north past the ski resorts, then the road began to wind its way up into the San Juans. It is called the Million Dollar Highway here because it cost that much and more per mile to build. 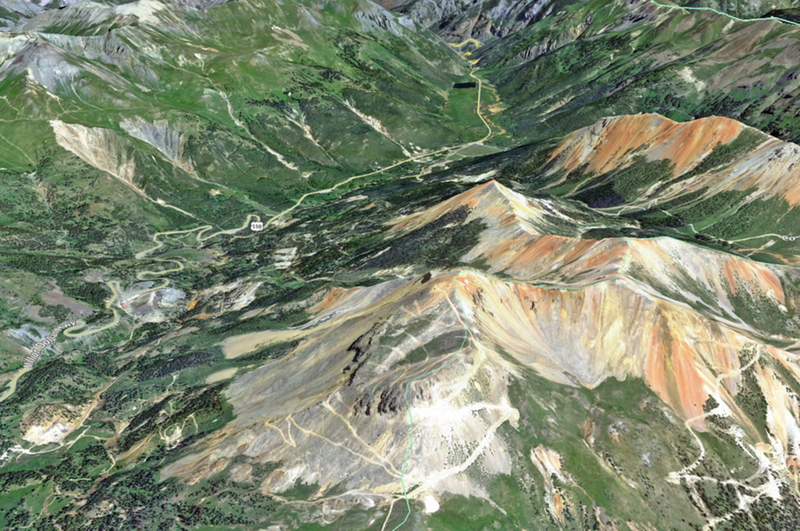 It wound over Coal Bank Pass and then Molas Pass (10,910 ft.), where I stopped to take some wonderful photos. It then curved its way down steeply to Silverton. I stopped wherever the road allowed for good views of the town below. Beyond Silverton the road travelled up a broad glacier-carved canyon toward Red Mountain Pass. I had seen a video on the Internet called “America’s Most Dangerous Highways” about this pass, and it seemed much worse on the video than it actually was. I wouldn’t want to drive an 18-wheeler around the switchbacks, but it was no problem in my minivan. In fact, I quite enjoyed the drive and the views were amazing. Just beyond the pass was the Idarado mine, with a great deal of infrastructure and even houses intact. I stopped and photographed it all. Large silver chimneys were discovered here in 1882 and within a few years, six different towns grew up around the pass, including Guston and Ironton. 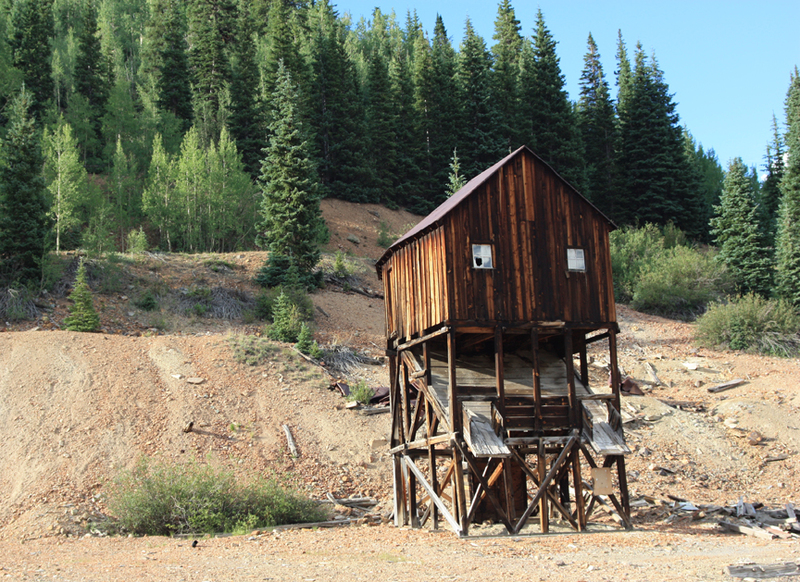 The most prosperous mine in the 1880s was the Yankee Girl; its headframe is still intact. Later, as prices dropped after the Silver Panic of 1893, some of the mines were closed and others consolidated as other metals were mined. Eventually the Idarado became the leading mine, gradually expanding its drifts, levels, shafts, and stopes. After World War II three major ore bodies were connected underground through the Treasury Tunnel. 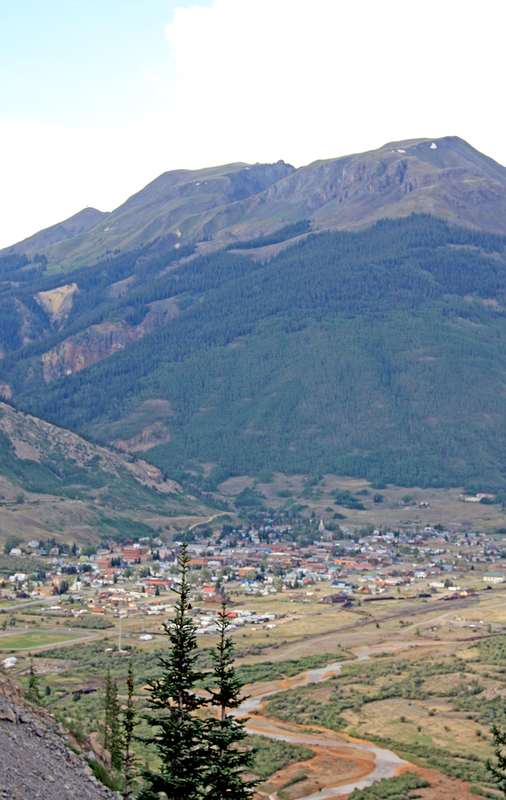 It began here at Red Mountain Pass and continued underground (with a few internal shafts which dropped over 1700 feet) until it reached the Pandora Mill above Telluride. Altogether, over 100 miles of drifts and tunnels were blasted out of these mountains. Mining continued here until 1978. It was just past sunset as I travelled on toward Ouray. The worst part of the road was the last five miles as it was carved out of the side of a steep canyon cliff face without any guardrails to speak of. It was just getting dark as I drove into Ouray and checked into the Western Hotel. 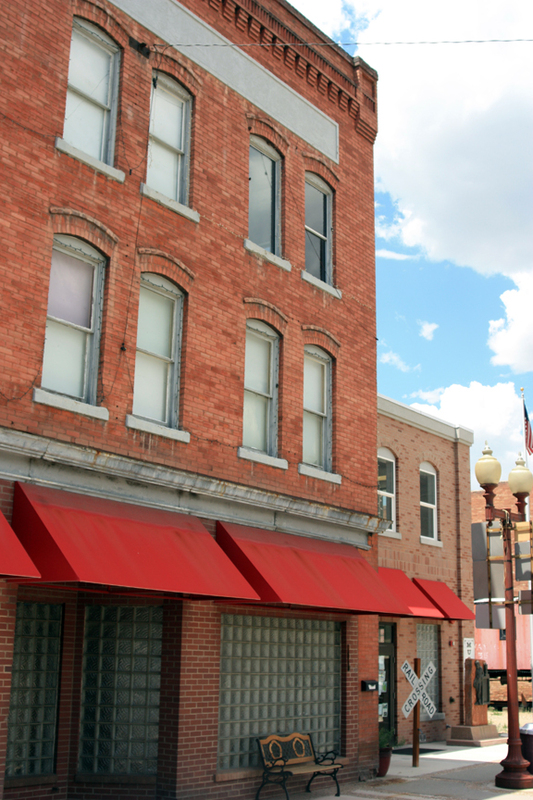 This is an authentic 1800s hotel and saloon, with European style rooms and a shared bathroom down the hall. I got everything charging up, and ate supper of excellent pizza in the saloon. 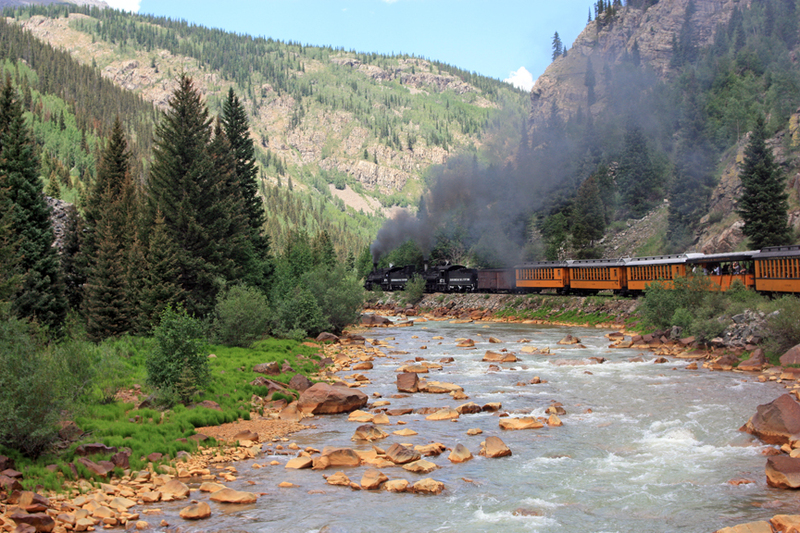 On the second day of my journey through Colorado’s mining towns, I rode the Durango and Silverton Narrow Gauge Railroad. I had reserved a seat in an open gondola on the second train. This is the second time I’ve ridden this train; the first was ten years ago, in 2002, when I took my two oldest children. I had a camera malfunction and could only take a few photos with my daughter’s film camera. This time I was loaded for bear, with my HD video camera and two batteries, two Flip cameras, my still camera, and my iPad, as well as a tripod, panoramic head, and my wireless microphone system. All this was in a backpack which was quite heavy. 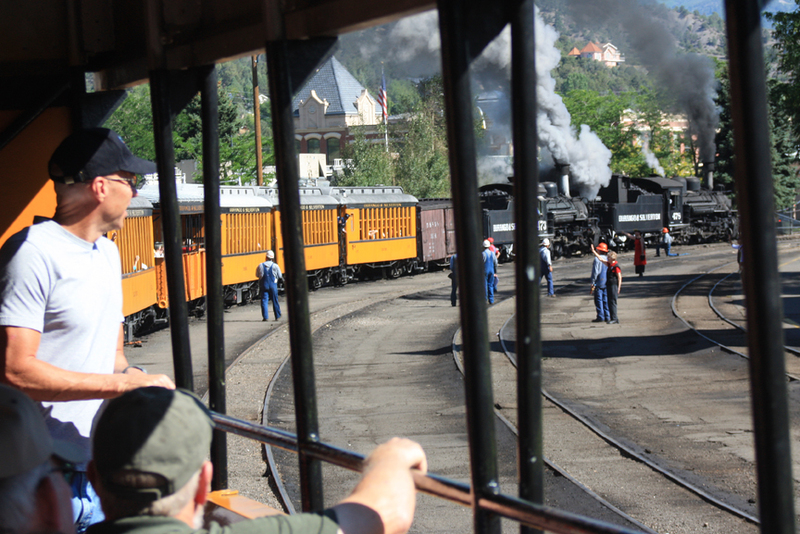 The D&SNGRR uses authentic steam engines to pull a combination of closed and open cars. The gondola car I was on has a roof and benches facing the sides but no windows – the sides are open to the air (and the soot from the engine). I was in car 30, toward the end of the train, which allowed some great photos as the train pulled around curves. 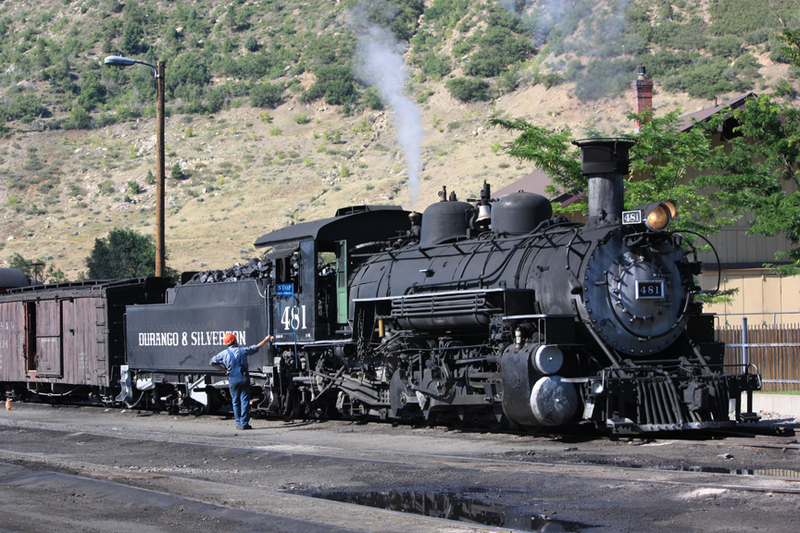 This train follows the actual route and grade laid down to service the mining town of Silverton. 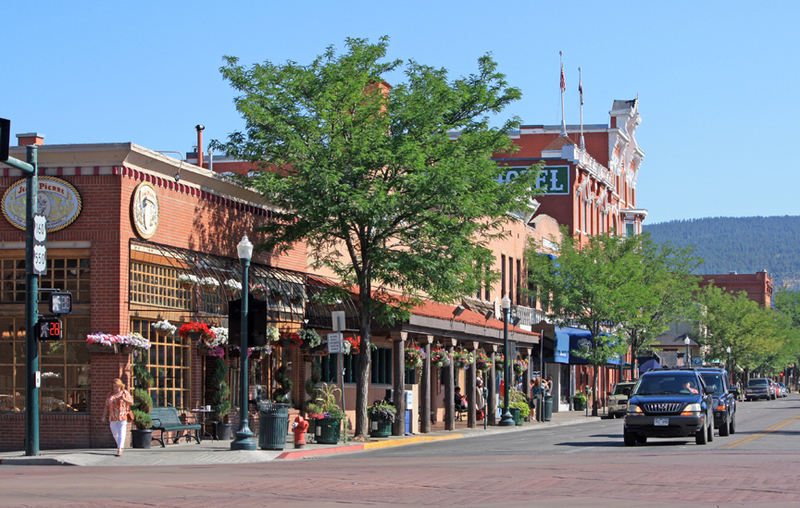 Durango was built as a railroad town and hub for the Denver and Rio Grande Railroad in 1881, and a narrow gauge track was built in 1882 along the Animas River from Durango to Silverton, a distance of 45.6 miles. 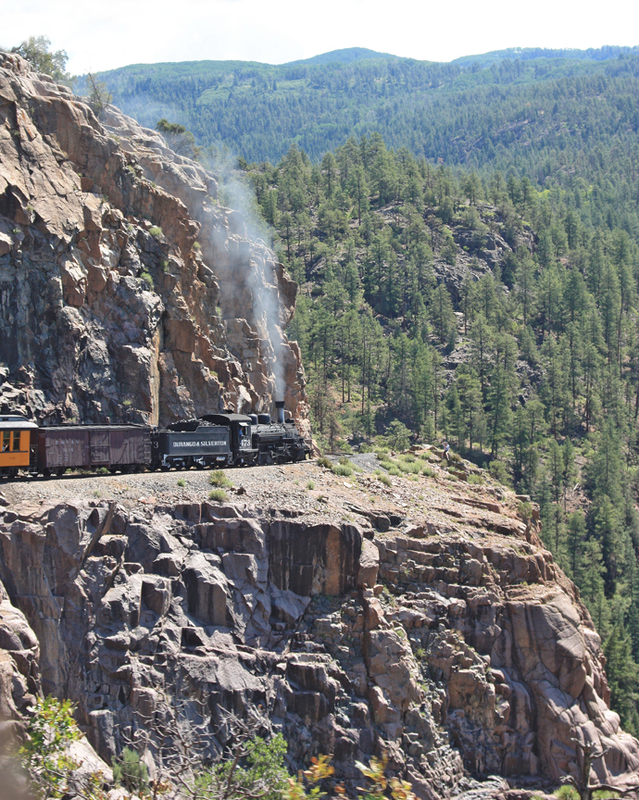 Part of the route was carved out of steep cliffs overlooking the Animas River Gorge, and it is spectacular scenery. 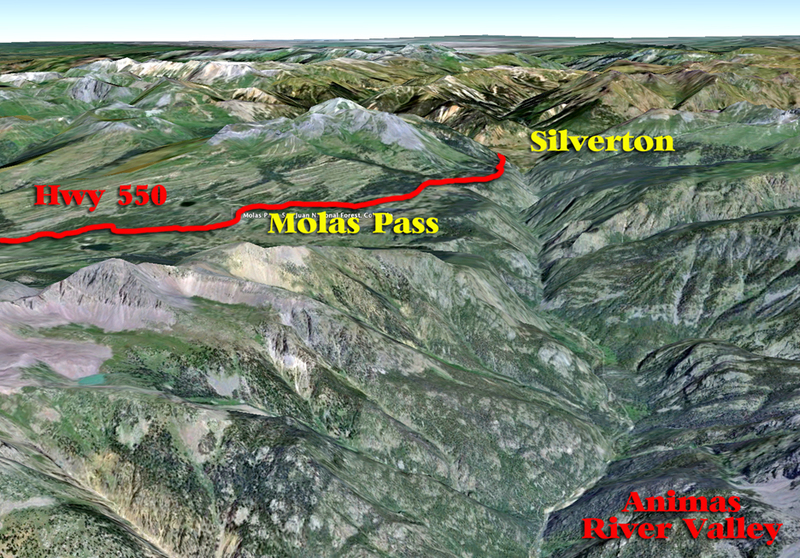 Three shorter routes extended on from Silverton into the canyons northward to service the mines and smaller communities. The route takes three hours each direction. 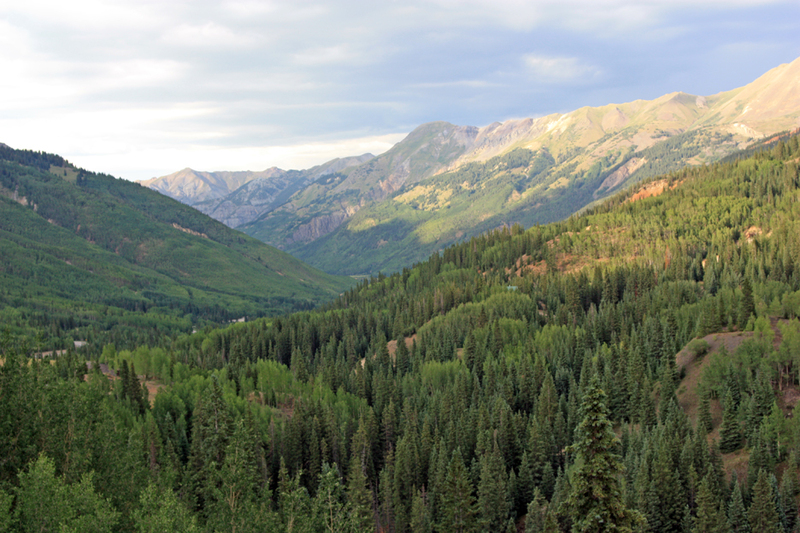 The first hour out of Durango is not very interesting – you gradually work your way north, crossing Highway 550 several times as you travel through trailer parks, along golf courses, farms, and a few towns and tourist traps along the Animas River. As we traveled, we noticed a lady by one of the crossings dressed in Native American costume waving a stick with feathers on it. Then a few miles up the track we saw her again at the next crossing, and again at the next. Either she’s a clone or she has fun every day greeting the trains as they pass, then jumps into her car and drives to the next crossing (the train is quite slow, so this is easy enough to do). I remember seeing her ten years ago doing the same thing. We reached the town of Rockwood and stopped to take on water and to pick up a few more passengers. This is the last town before the gorge. Leaving Rockwood the grade winds its way up the side of the canyon wall, with shear cliffs falling into the swirling river below. The train inched its way around curves, puffing and belching soot and steam. If you’ve seen the movie Butch Cassidy and the Sundance Kid, it is here that Robert Redford and Paul Newman (or their stunt doubles) jumped from the boulder onto the train. It was also here in the gorge where they jump into the river to escape the persistent posse. 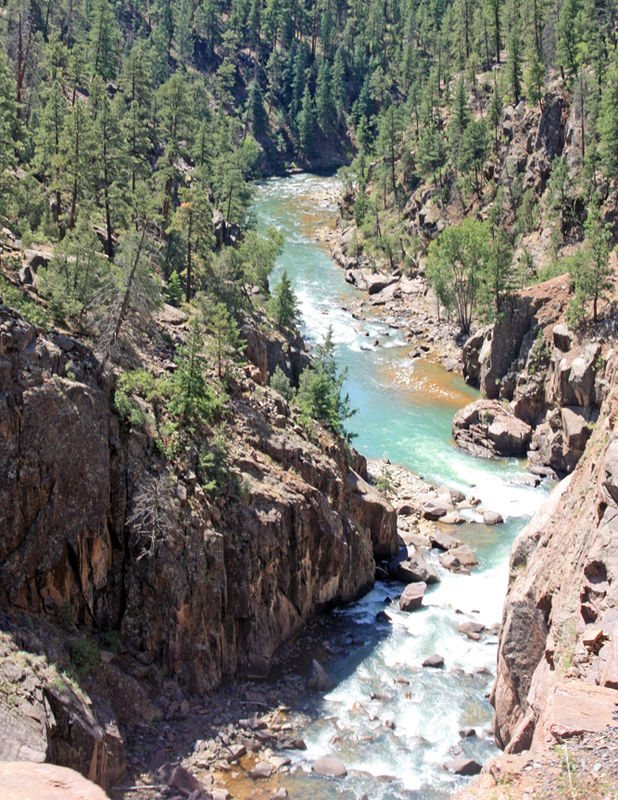 The Animas River Gorge. If you were to jump in, the fall would probably kill you . . .
Further up the river the rocks along the edges of the river take on a reddish-orange tint. Some of this is natural staining from iron sulfate deposits further up stream. 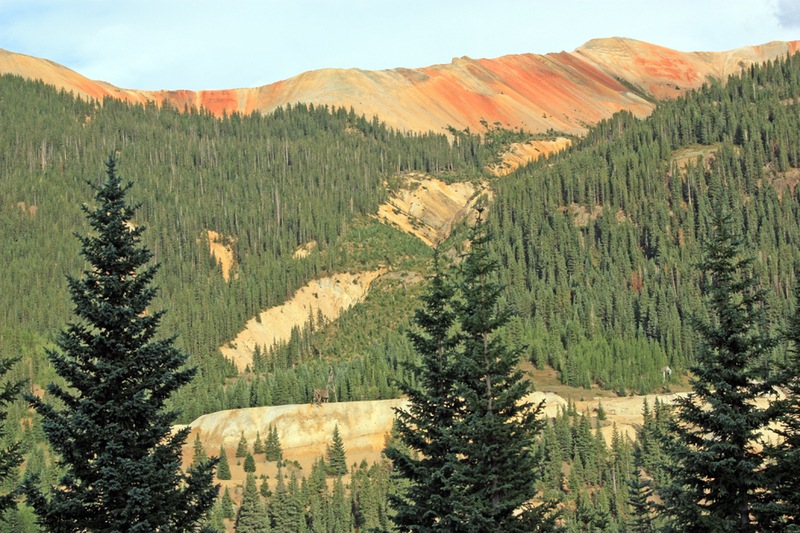 The silver ore was associated with these same deposits and years of smelters and concentration plants, along with exposed tailings piles, have added greatly to the stain. I videotaped much of our journey and tried to narrate some of it, but there was too much noise even for the wireless microphone. I talked with other passengers. One had gotten a teaching credential from San Jose State in science education the year after I went through the program. I also walked between the cars with a Flip camera and got some good footage. 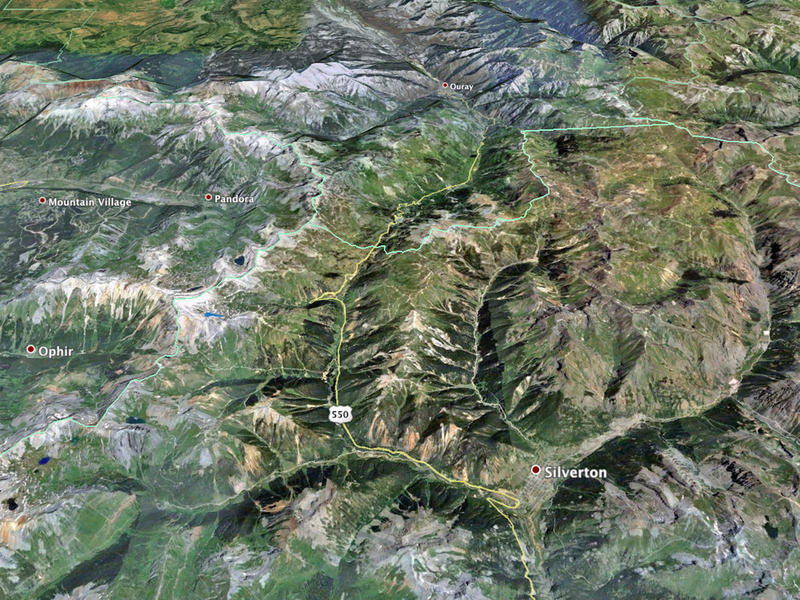 As the valley opened up just before Silverton, a stray gust of wind blew my hat off and out of the gondola. 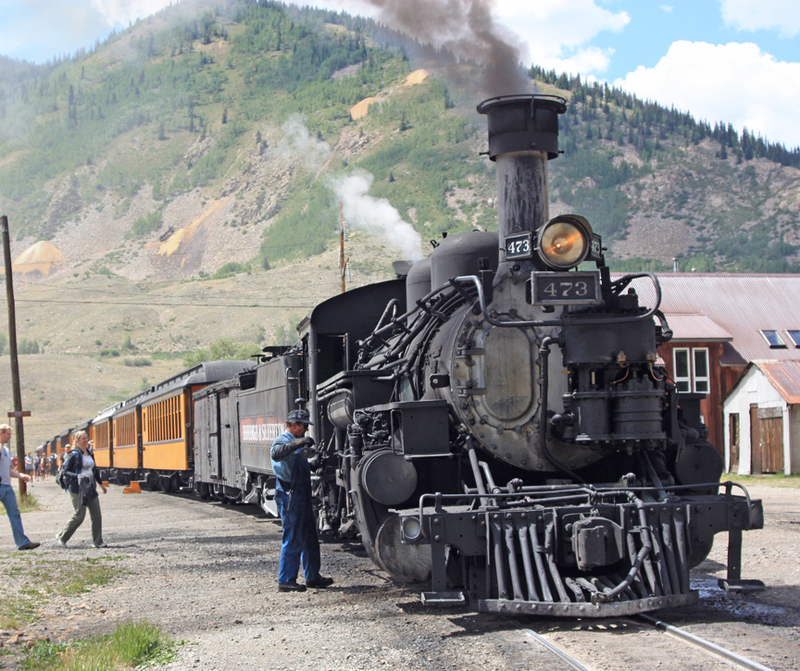 In Silverton, I walked with my heavy backpack over to the depot office to see if the chase car that follows the train (just in case the steam engine lights any fires) could look for my hat. 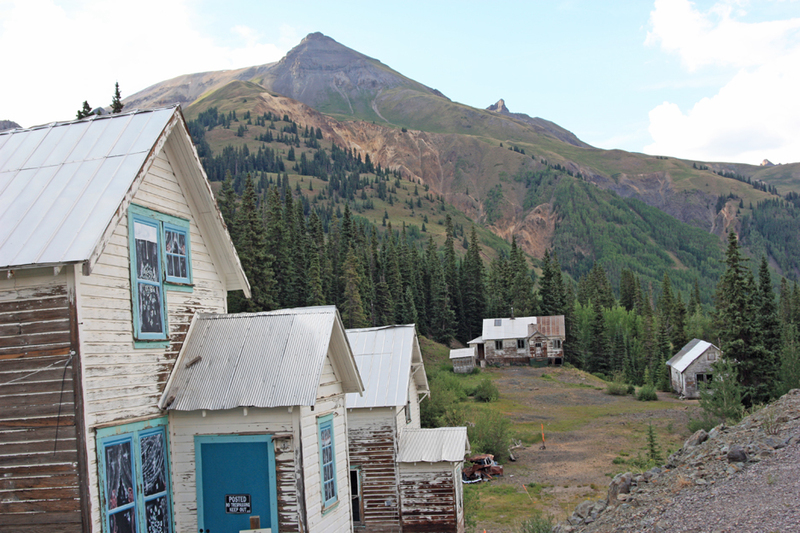 I ate a buffet lunch, then used my panoramic head to get some panoramas from the center of the streets in Silverton. I also videotaped the first train pulling out, our train using the triangle tracks to turn around and back into the station, then got some great footage of the train blowing off steam. We boarded about 3:00 and left at 3:15. On the way back to Durango I saw my poor hat lying right beside the river, but there were no good landmarks to locate it by. It never was recovered. And I liked that hat . . . I used up all the batteries on my HD camera, filled two SD cards on my still camera and used the batteries up for that as well (I wasn’t able to get them completely recharged this morning), and filled up most of the Flip cameras. Inching along the gorge, I was on the outside this time and got some great shots (I hope) of the train and the gorge below, with my last battery dying just as we got to Rockwood. From there on I dozed as best I could on the uncomfortable bench with the constant rocking of the car. We arrived back in Durango about 6:30. Back at Lightner Creek Campground, it was raining slightly and I did the best I could to charge up my camera batteries by wrapping the cameras in plastic bags and setting them on a camp chair to keep the rain out. I had set up my tent that morning, so I called home while waiting for the rain to end, made supper, read a book on my iPad, and enjoyed a comfortable evening. 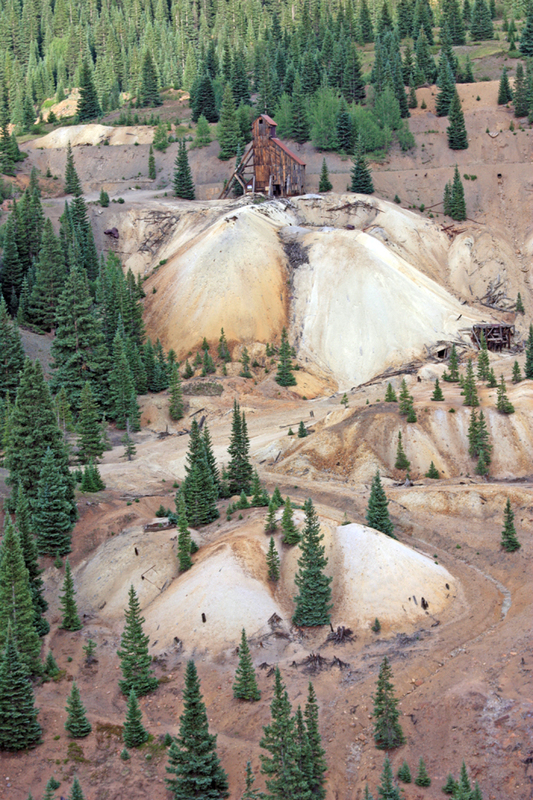 The following posts will detail my expedition to document the history of mining in Colorado. Funds for this trip were provided through Teachers Without Borders and the MIT BLOSSOMS project, sponsors of the What If Prize competition. I began my journey on Monday, July 9. After getting everything packed in my Dodge Grand Caravan mini-van, I left my home in Orem, Utah about 11:00 and traveled south on I-15 to Spanish Fork, then east on U.S. 6 through Spanish Fork Canyon. I stopped to take a few photos of the Thistle mudslide and what’s left of the town of Thistle itself. In the fall of 1982, after two weeks of constant rain brought in by a tropical storm, a large section of the canyon wall gave way and slid into the bottom, damning the river and flooding the small town of Thistle. The main Denver and Rio Grande Railroad had to build tunnels through the slide and U.S. 6 had to be routed around the disaster. Now, thirty years later, the slope is still unstable but is beginning to get a re-growth of oak brush, but no pine trees yet. 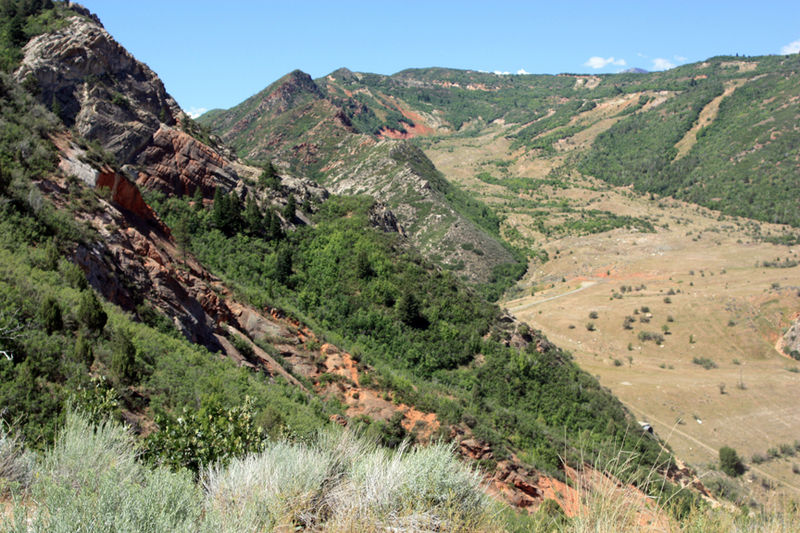 The mudslide that destroyed Thistle, Utah: Thirty years later. 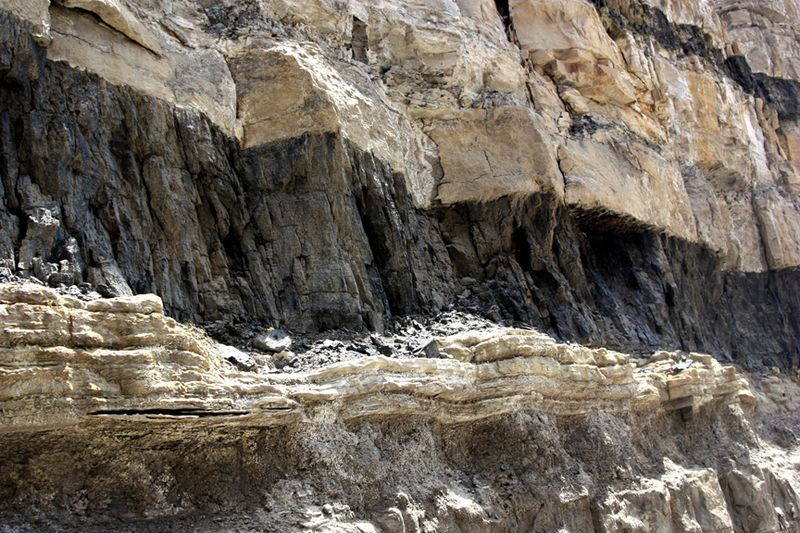 Coming down the east side of Price Canyon, I stopped at a road cut where a nice coal seam is visible. This one is too thin to be economically mined, but it gives an idea how the coal is interbedded with sandstone and shale layers. The coal began as swamps during the Jurassic Period that ringed a shallow inland sea which covered eastern Utah. Rivers drained from a tall mountain range on the Utah-Nevada border eastward into the sea, depositing layers of mud and sand over the swamps, which became compressed into coal. Dinosaurs walked in these mudflats and left footprints in the peat moss, which filled in with sand and are now found in the roof of the coal seams. Coal seam in a road cut along U.S. 6, near Helper, Utah. 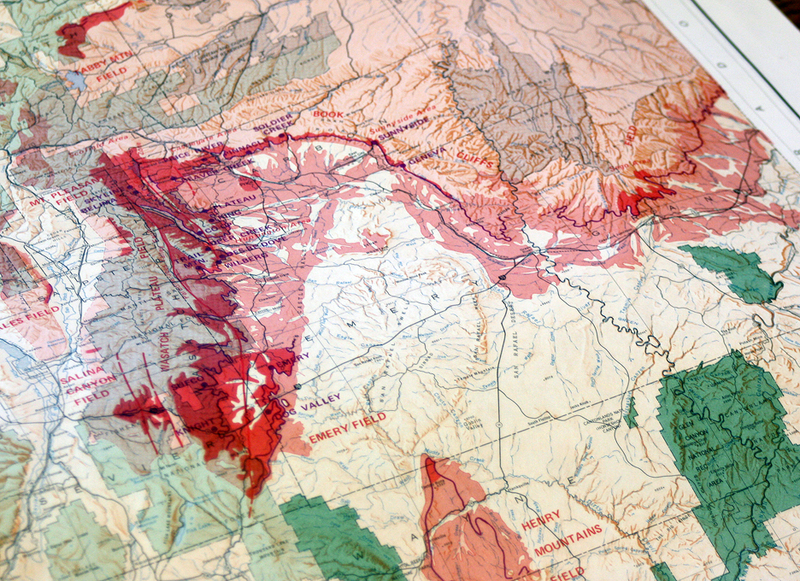 The layers were later uplifted when the Rocky Mountains rose along with the rest of the Colorado Plateau. The center of the plateau bulged into a giant syncline, the San Rafael Swell. The coal seams became exposed in the edges of the Book Cliffs in a giant crescent, now called the Carbon Crescent that stretches from Green River around to Emery. In the early 1880s the Denver and Rio Grande Railroad was built between Denver and Salt Lake City. My own Great-Great-Grandfather, Joseph S. Black, worked to build the railroad grade with scrapers and horse teams. He discovered a large coal seam that he sold for $3000. It became the Castle Gate Coal Mine, one of the first large mines in the district. 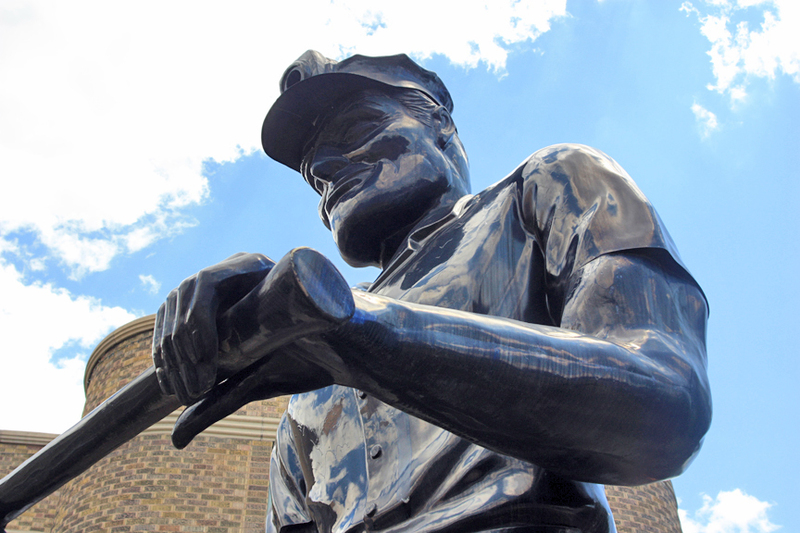 A very big coal miner. This statue is at the library in Helper, Utah. The Western Mining and Railroad Museum in Helper, Utah. 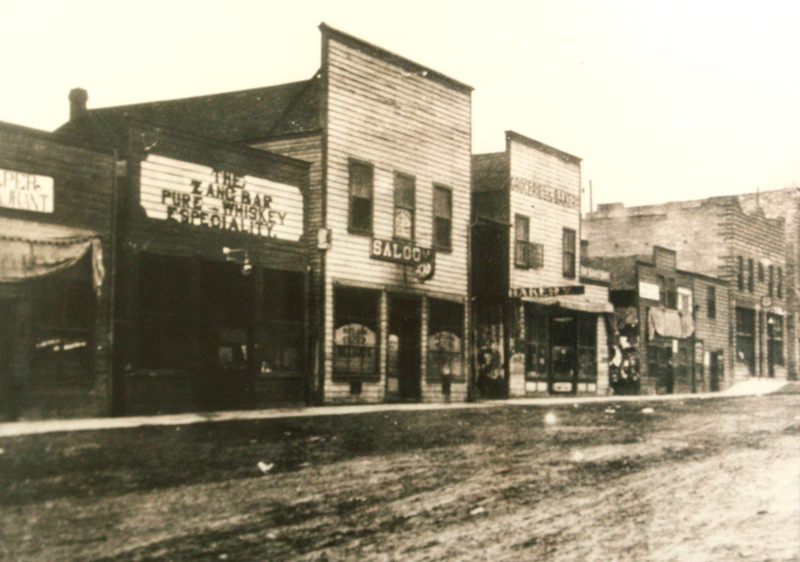 The Main Street of Helper, Utah during the early days of coal mining. 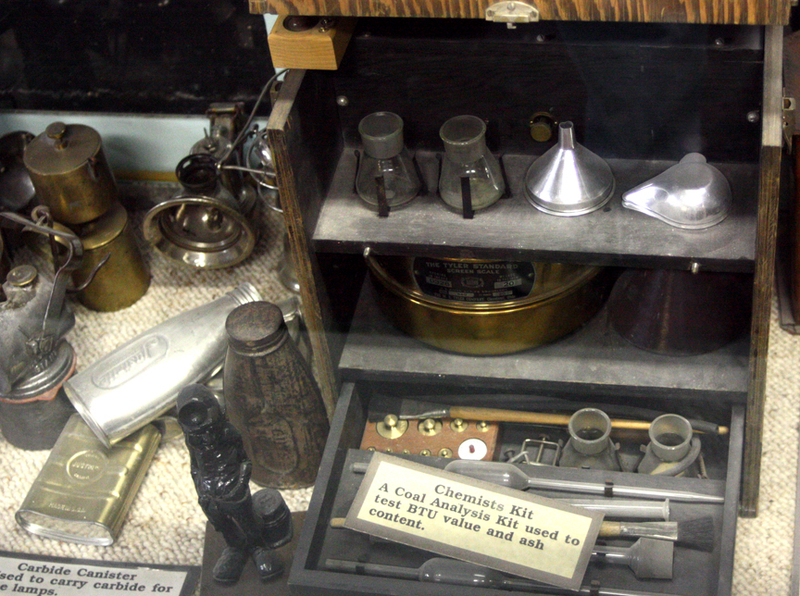 The museum takes up the rooms of an old hotel, plus a new annex, and is organized by topic (such as the shadier side of life in Helper, with gambling tables and whiskey stills from Prohibition days) and by community (with rooms for each town in the district, such as Clear Creek or Sunnyside). There was a room on doctors and dentists, with a complete dentist’s chair and equipment, a room on schools, one on laundry facilities, one on sports teams, one for grocery and dry goods stores, etc. Downstairs was a large room with equipment used in the mines, such as rescue breathing apparatus, miner’s helmets, lamps, coal assaying equipment, and diagrams of how coal is mined. 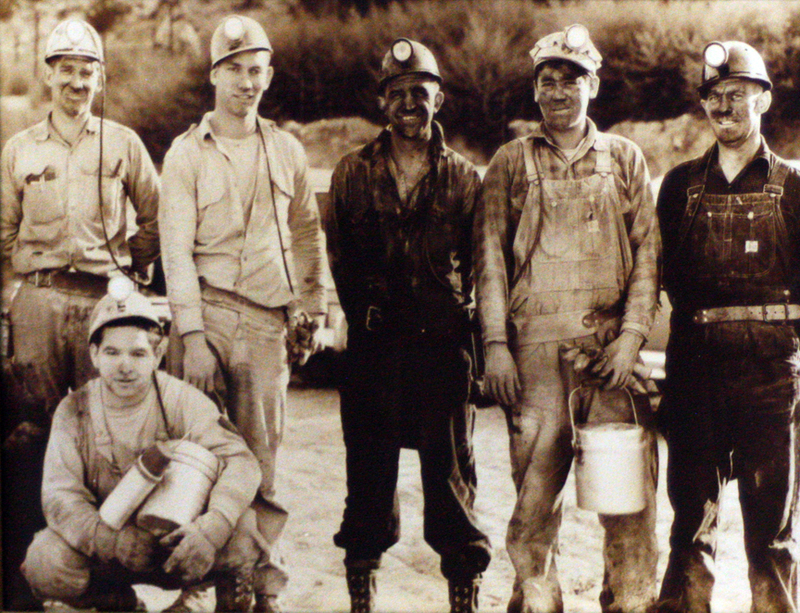 Miners at the Sunnyside coal mine, circa 1955. Map of the Carbon Crescent, represented by the red and pink coal deposits around the San Rafael Swell and Book Cliffs in eastern Utah. A large coal seam is basically a layer that is at least six feet thick and extends left and right of the main portal and into the side of the hill, often for miles. After over 100 years of mining, the coal seams are still extensive and there is enough here in the Carbon Crescent of Utah alone to serve all of the United States for at least 200 years. 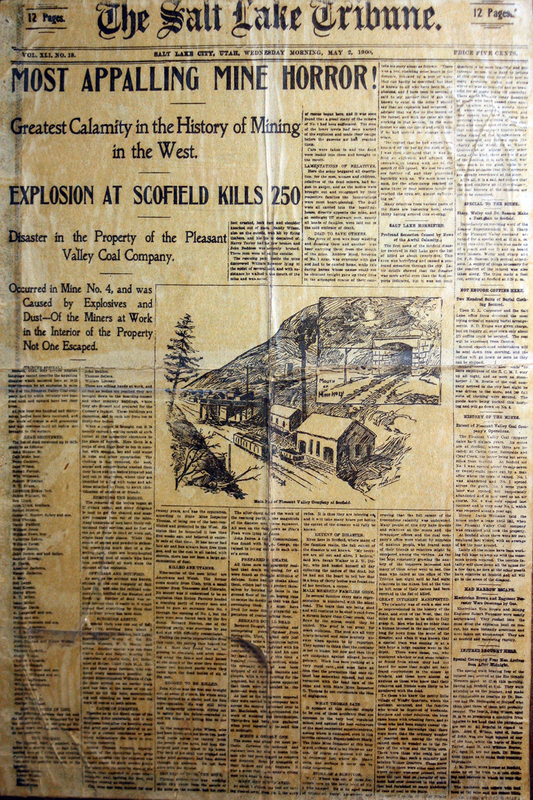 Newspaper announcing the Winter Quarters mine explosion in Scofield, Utah on May 1, 1900. One room was dedicated to the Winter Quarters mine disaster of 1900. 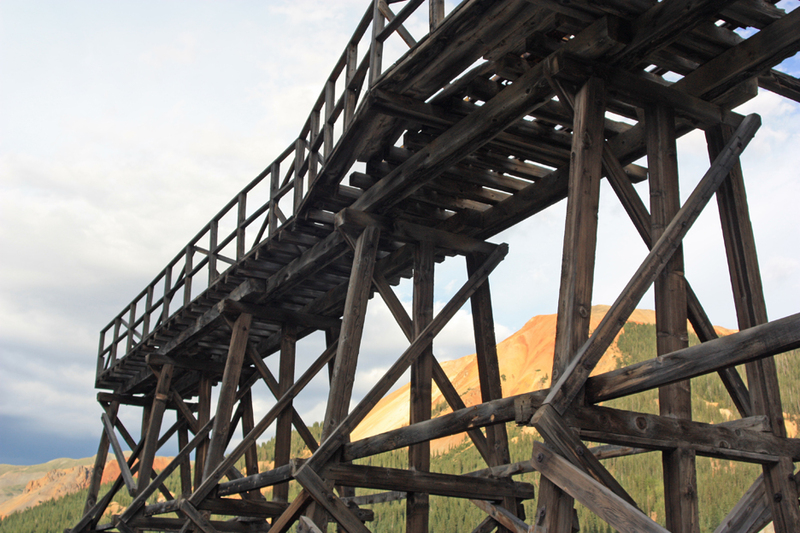 On May 1, 1900, a new shift had just entered the Winter Quarters Mine Portal 4 when a huge explosion blew out of the portal, sending timbers and coal cars across the canyon as if they had been shot out of a rifle barrel. About 250 men were killed, in some cases wiping out every male member of entire families. At the time, it was the worst mining disaster in U.S. history. This photo is from the Salt Lake Tribune the day after, and was found glued to a board hanging in a school that was torn down many years later. The cause of the accident was eventually ruled to be a dust explosion, and new safety procedures were put into place in coal mines to try to prevent it from happening again. The coal was slow to get out when miners used the standard hard rock tools of picks, shovels, mules, and dynamite. 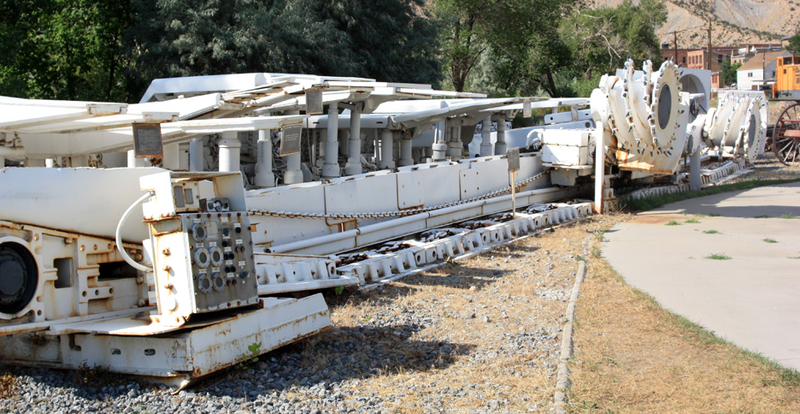 In the 1950s, automated mining machines were installed, culminating in the long-wall mining machine. The long-wall miner (or continuous miner) is a large shearing blade that slices left and right along a seam, taking three feet of coal in one pass. Behind the blade is a continuous conveyor belt that transfers the coal to the side, then to another belt that transports it out of the mine to the processing center where it is broken, sorted, and shipped off in trains and trucks. Behind the shearer, hydraulic lifts hold the ceiling in place until the machine is advanced. The machine usually is placed at the back of the mine and cuts forward, so the ceiling collapses behind it as it cuts its way out. Display showing how a long-wall mining machine works. It was a much more extensive exhibit that I realized, and I stayed longer than I intended, about three hours. I left at 5:00. On my way beyond Wellington, some rocks had fallen off of a truck and were scattered across my lane. I didn’t see them in time to dodge, and my right front wheel struck one and immediately began to vibrate. Within a couple of miles my tire was flat. I had to get out the spare (not easy in a mini-van) and change the tire. The rim was dented and the tire itself looked damaged. I drove on the spare about 50 miles to Green River, where I found an open shop. They didn’t have a rim to fit, after several tries and much wasted time. Eventually I had them put the spare tire on the right rear and the right rear on the front and traveled on. It was 9:30 by the time I left. Kit for analyzing the BTU (heat) content of coal. I had to drive slowly to protect the spare, and it was already dark when I drove down State Road 191 through Moab and beyond to Monticello, where I picked up Highway 491 (formerly 666) through Cortez. I had to pull over in a place called Pleasant Valley in order to take a nap, as it was very late and I was getting drowsy. I finally pulled into the Lightner Creek campground near Durango at about 2:00 in the morning. I was too tired to try to pitch my tent, so I threw a tarp on the ground, laid down a thick comforter and my sleeping bag, and wrapped the tarp over me like a burrito to protect myself from a light drizzle of rain and slept tolerably well.